Endgame In Gaza? Will Hamas Collapse or Just Fade? Israel’s leaders have purposely obscured their war aims in Gaza. But there are only two possible endgames: (A) a Lebanon-like cessation of hostilities to be supervised by international observers, or (B) the disintegration of Hamas rule in Gaza. Under tremendous international pressure — including from an increasingly wobbly U.S. State Department — the government of Ehud Olmert has begun hinting that it is receptive to a French-Egyptian cease-fire plan, essentially acquiescing to Endgame A. It would fail on its own terms. It would have the same elements as the phony peace in Lebanon: an international force that abjures any meaningful use of force, an arms embargo under which arms will most assuredly flood in, and a cessation of hostilities until the terrorist side is rearmed and ready to initiate the next round of hostilities. Israel’s security cabinet met for four hours to proposals made by Bernard Kouchner, the French foreign minister, that Israel’s offensive should stop for 48 hours to allow aid delivery. The security cabinet was so divided on the issue that an order was given by Ehud Olmert, the outgoing Israeli prime minister, forbidding details of the discussion being released to the press. It is understood Ehud Barak, the defence minister, favoured a 48 hour lull to probe Hamas’s willingness to discuss a cessation of rocket fire from Gaza but Mr Olmert and Tzipi Livni, the foreign minister, disagreed. They argued that a lull would ease pressure on the Islamist movement and allow it to regroup. The meeting eventually broke up with Mr Regev saying that “at this time the operation will continue”. 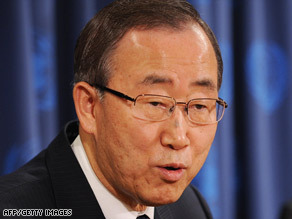 He stressed that Israel was allowing some humanitarian aid into Gaza already. 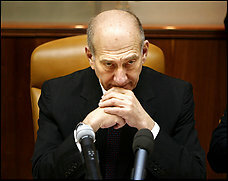 You are currently browsing the archives for the Ehud Olmert category.